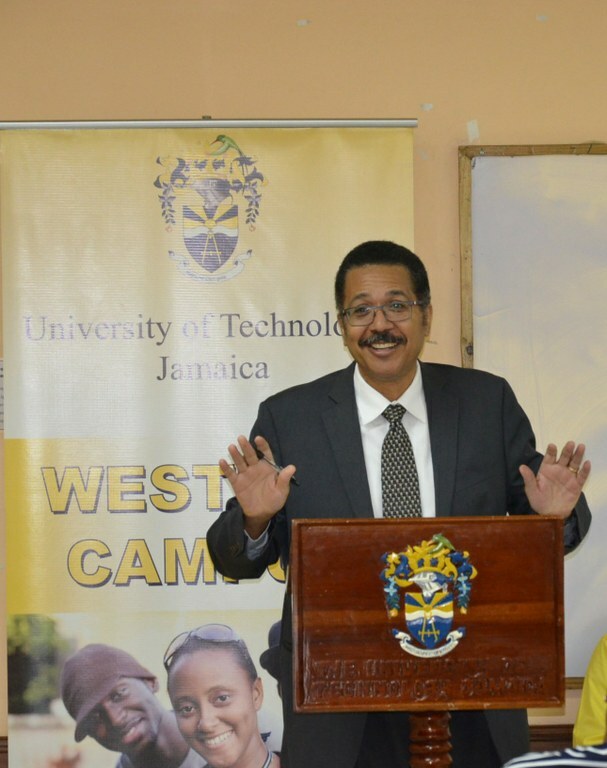 Western Campus must be ‘a strong foundation for UTech, Jamaica’ says Prof. Vasciannie — UTech, Ja. Prof. Stephen Vasciannie, President, University of Technology, Jamaica, as part of his continued introductory meetings with members of the University community, journeyed to the Western Campus on Friday, January 13, 2017 for a general staff meeting with all members of faculty and staff as well as specially invited student representatives. The President was accompanied by a delegation comprising the University Registrar and Deputy Registrar, AVP, Undergraduate Studies, Deans for Colleges/Faculties for programmes offered in the west, other select administrative offers and Mr. Noel Whyte, member of Council who specially represents the University’s interests in western Jamaica. The team visited and toured the facilities at both the Dome Street main campus and the Barnett Street location of the University’s Caribbean School of Nursing, College of Health Sciences. In his address at the Dome Street campus, Prof. Vasciannie asserted that all efforts must be made “in making sure that the Western Campus is a strong foundation for the University of Technology, Jamaica.” In this context he underscored the need for the University to be integral in reaching out to both the immediate and wider communities that it serves. In emphasizing the University’s obligation to outreach and service, the President noted that, “the people that pay our salaries, the students and the government expect us to be integral to the communities we serve…not only to the immediate community, but to the wider Montego Bay community and the wider Jamaican community,” adding that the more we are seen engaging with others in the community, the more the wider society will see the value of the institution. In his continuing emphasis on the University’s purpose, Prof. Vasciannie framed his address with the reminder that the Institution’s raison d’etre is that of “teaching research and outreach.” Acknowledging that there will be instances of struggles and disagreements, he urged for such issues and concerns to be constructively resolved in the spirit and context of carrying out the University’s central purpose. “Our purpose is teaching, research and outreach, not quarrelling,” he said, to both the amusement and applause from the gathering. Prof. Vasciannie also repeated his perspective that the University of Technology, Jamaica should maintain its commitment to teaching and research in the humanities, law and other areas which are not purely scientific. “The vision I have with respect to focus is that we must of course continue to focus on technology, but keep the originating statutes of training and education in areas including the humanities, law and the arts,” he said to approving applause from the gathering. The new President also took the opportunity to reiterate his intention to oversee a University of “inclusivity”, operated with “transparency, honesty and fairness” and where the views of academic, administrative staff and students are given equal voice and regard. Emphasising that “the students are why we are here,” Prof. Vasciannie urged everyone to take students interests fully into account and at the same time called for students to give respect and appropriate regard for the rules and procedures governing the institution. In underscoring the need for greater levels of student-friendliness, Prof. Vasciannie further appealed for increased focus on levels of efficiency in all of the University’s operations. 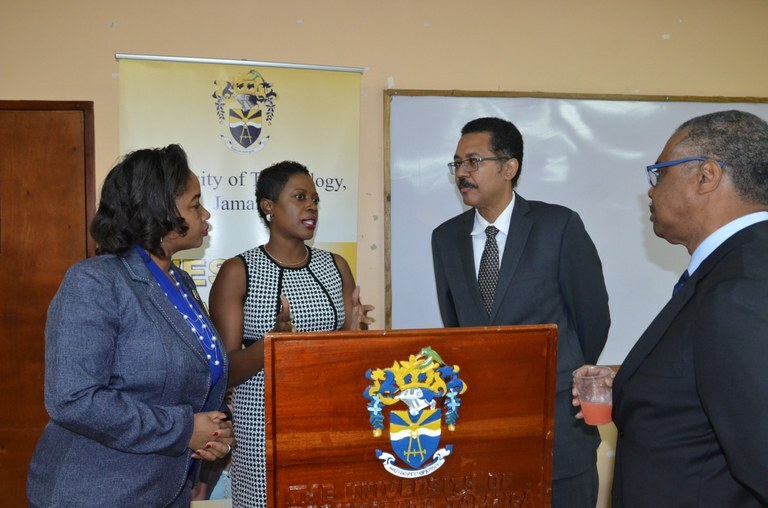 “UTech, Jamaica must be a model of efficiency to the wider society and must position itself so that people can say that in terms of efficiency, everything is in place at the right time,” he noted. Prof. Vasciannie in concluding his remarks provided an update on two major processes now being undertaken at the University – the thrust for Institutional Accreditation by the University Council of Jamaica (UCJ) and the Septennial Review which is currently being led by a specially constituted Secretariat. The President reported that the Institutional Accreditation Project Team has completed the first draft of the Institutional Self Study (ISS) document which will form the basis of the University’s application. The ISS document is targeted for submission to the UCJ by January 31, 2017. He encouraged members of the Western Campus to be on alert to receive possible UCJ visits as part of the process. With respect to the Septennial Review, he called for all members of staff to be responsive in providing information to enable the team to gather the required information to review the University’s operations over the last seven years leading up to 2013. Pointing out that the Septennial Review will be both “backward and forward looking,” he noted that the report will contribute towards the assessment of the next Strategic Plan for the University. Prof. Vasciannie was warmly welcomed by members of faculty, staff and students, led by newly appointed Director of the Western Campus, Miss Sophia McIntosh. A robust question and answer session followed the President’s address in which he fielded questions related to student concerns, financial status of the campus and issues raised regarding security at and in the environs of the Dome Street campus. 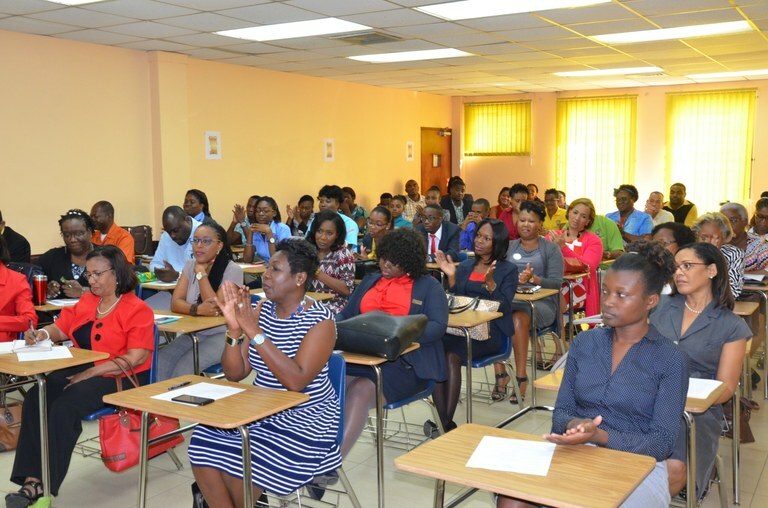 This was followed by a tour of the campus facilities at both Dome Street and the Caribbean School of Nursing located at the Barnett Street campus in Montego Bay. Prof. Vasciannie listens keenly to issues and concerns raised by student representatives and staff. 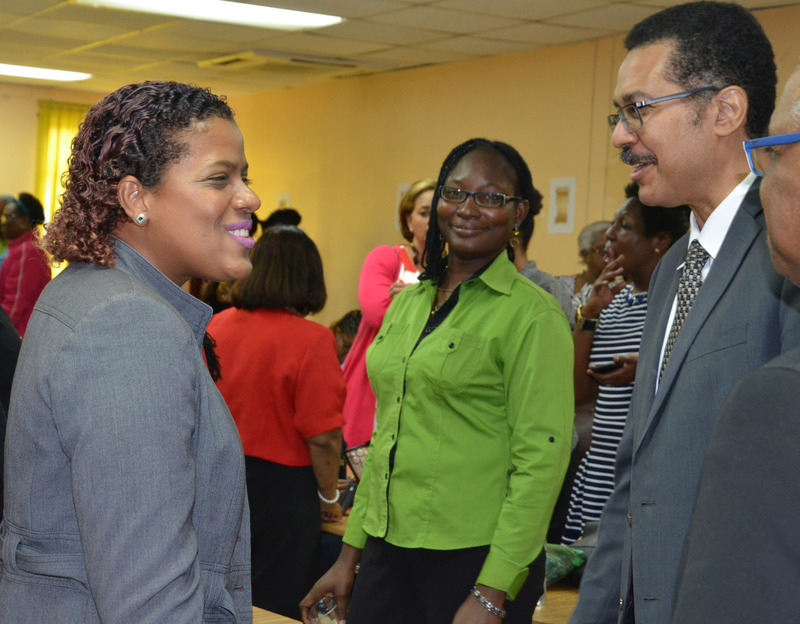 Miss Sophia McIntosh, (2nd left) Western Campus Director in discussion with (from left) Miss Antoinette Smith, Western Campus Administrator, President Vasciannie and Mr. Noel Whyte, member of Council. 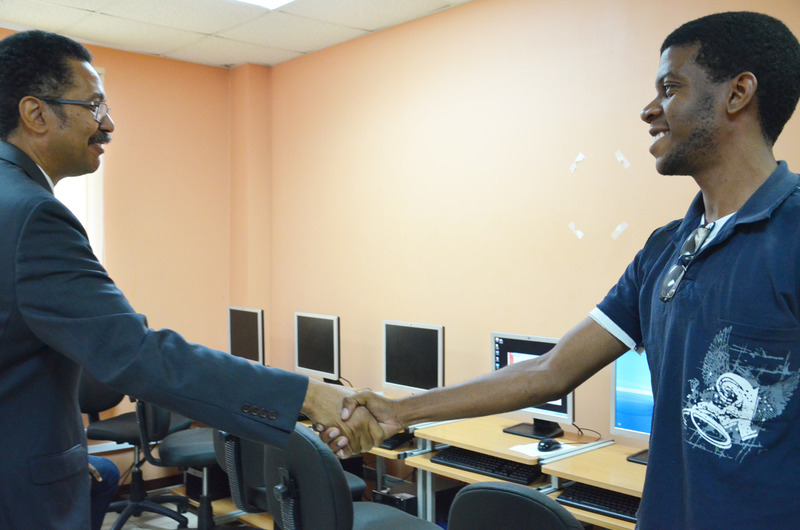 President Vasciannie tours the Calvin McKain library located at the Dome Street, Montego Bay campus. At left is Dr. Elaine Wallace, University Registrar. Prof. Vasciannie is warmly welcomed by members of faculty and staff. President Vasciannie (3rd left) poses for a group photograph with the team from both the Western and Papine campuses prior to his departure from the Caribbean School of Nursing located at Barnett Street, Montego Bay.